However, you can also use the MyFRITZ! 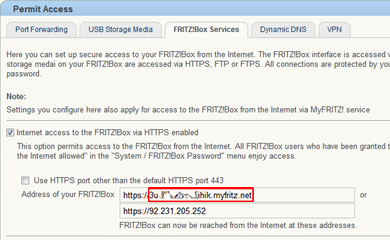 domain name to access your FRITZ!Box directly, for instance using a bookmark in your browser. In addition, you can also use the MyFRITZ! domain name to establish VPN connections to your FRITZ!Box or access applications and services in your home network for which you configured port sharing in the FRITZ!Box. Click the "FRITZ!Box Services" tab. Make note of the MyFRITZ! domain name of the FRITZ!Box displayed in the field "Web address of your FRITZ!Box". It begins after the "https://" and ends with "myfritz.net" (see fig.). Now you can use the MyFRITZ! domain name you determined to access the FRITZ!Box directly.